I am thrilled to bring you a very special posting today!! Noted French Photographer, Stephanie Gaveau Mounts, has graciously allowed Titillating Tidbits to publish several of her stunning photographs from her Versailles Portfolio. In the article below, Mounts shares the inspiration behind the photographs (SGM) and journalist Leah Marie Brown explains the historical significance of the places featured(LMB). Mounts also shares the technical details of each photograph so budding photographers can attempt to reproduce similar images. SGM: "This room attracted me for several reasons: the vibrant shade of green on the walls, the way the scarlet bed curtains contrast yet complement the walls, the way the light came through the massive windows. It was an inviting and cozy space in spite of its large size." Technical Details: Nikon D90, f/3.5 at 1/25 sec, 27mm focal length, no flash. I processed this photo using the “bleach Bypass” filter in Photoshop. LMB: The dauphin's chamber is where the eldest son of the King of France would have lived while in residence. 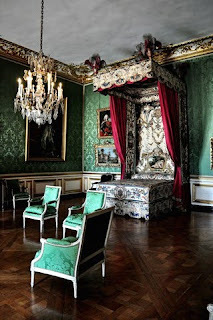 The room, as photographed by Stephanie Gaveau Mounts, is decorated as it would have been during Louis XV's reign, although the bed is not the original dauphin bed but one that was made for an aristocrat. 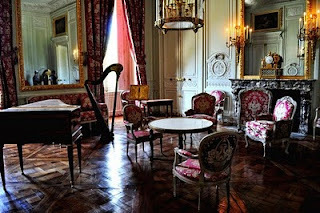 During the late 18th century, this room was used by Louis-Charles, the son of Marie Antoinette and Louis XVI - who would end his short, tragic life in a dank prison cell, twisted and emaciated from tuberculosis. One wonders if, in his final, lonely days, that poor, frightened little boy ever closed his eyes and dreamt of happier times - of gilded days spent playing with toy soldiers in the magnificent green Ddauphin's chamber. SGM: "This topiary garden spoke volume to me. I could easily imagine the King and Queen taking a stroll down this path, followed by a throng of court members. I especially loved the way the white marble statues contrasted with the deeper hues of the garden." Technical Details: Nikon D90, F/13 at 1/640 sec, 55mm focal length, no flash. LMB: Topiary, the art of clipping living plants into defined shapes, has its origins in ancient Rome. Topiary gardens reached the peak of their popularity in the sixteenth century and were out of vogue by the eighteenth century. Although Marie Antoinette preferred a more natural style of landscaping (she was a subscriber to Rousseau's natural movement and instructed Mique and Robert, her architects for Le Hameau, to plan an "easy" garden filled with honeysuckle, hollyhocks, and creepers), I imagine her romantic and artistic sensibilities would have appreciated the beauty and mystery of the Topiary Garden. Stephanie Gaveau Mounts has wonderfully captured the splendid, titillating atmosphere of the Topiary Garden. 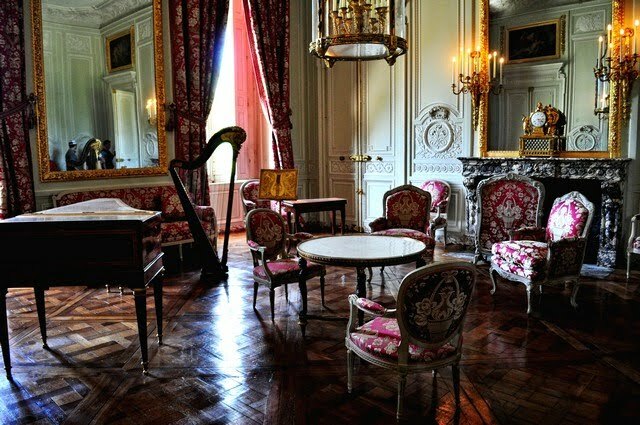 SGM: "The Salon de Compagnie in Marie-Antoinette’s Petit Trianon is absolutely beautiful with its vibrant and delicate chair fabric and matching curtains, and its stunningly rich wooden floors. The window lighting made this room quite inviting, and in spite of this room being so ornate, it attempted to bring out its comfortable and inviting cozy elements as well." Technical Details: Nikon D90, F/ 3.5 at 1/50 sec, 18mm focal length, no flash. I applied a “Bleach Bypass” filter in Photoshop to make the lighting more subtle. LMB: Louis XIV and his great-grandson, Louis XV, are known for their ardent devotion to the ... how shall I put this ... more masculine pursuits. In other words, they loved riding: horses and women. What most people do not know is that both kings also enjoyed getting in touch with their more "feminine" side through gardening. Louis the Beloved could clip a mean rose! It was Louis "the Beloved" XV who had the north east grounds of Versailles transformed into what is today known as the Petit Trianon. The king's botanist, Bernard de Jussieu, plotted and toiled for many years, planting fruit and coffee trees, and flower and fruit gardens. By the time the wide-eyed, fresh-faced fifteen-year-old Marie Antoinette arrived at Versailles, the lecherous old king (and his back-busting workers) had carved and coaxed a beautiful blooming garden out of the grounds around the Petit Trianon. It has been written that when handing his pretty, boisterous wife the keys to the small chateau, Louis XVI said, "You love flowers, Madame, so I am giving you a bouquet." The metaphorical garden would become Marie Antoinette's refuge. When the cloying confines of the palace and the nauseating nature of the faithless fawners who filled its many halls became too much, she would escape to the Petit Trianon. It was in the opulent, light-filled Salon de Compagnie that she would receive her friends and special guests. Today, visitors to the Salon de Compagnie will be happy to learn that little has changed within the room since the time of Louis XV (though the charming, embroidered red fabric on the chairs as photographed by Stephanie Gaveau Mounts was chosen by Marie Antoinette). 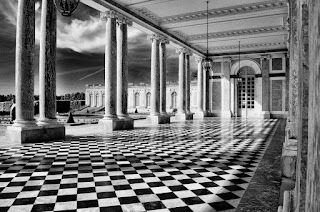 SGM: "The Peristyle outdoor hallway at the Grand Trianon is always a great opportunity for a great picture. After choosing the best angle (one that would show as much of the hallway as well as the garden in the background), and waiting for the masses of visitors to clear out the area, I quickly snapped this shot. I like the way this angle renders the hallway as grand as it actually looks in person, and how it shows glimpses of the sumptuous gardens, onto which it opens. I love the way the shadows hit the marble floors, depending on which time of day it is. In post processing, I applied an Infrared filter in Photoshop." Technical Details: Nikon D90, F/9 at 1/320 sec, 18mm focal length, no flash. LMB: Louis XIV used the Grand Trianon as a place to retreat from the the buzzing hive of political activity and court intrigue that was the Chateau de Versailles. (Side note, the Grand Trianon was called the Marble Trianon in Louis XIV's time period because of all of the Languedoc marble used in the construction and decoration of the building). After the Sun King's death, the Grand Trianon fell into disrepair until Louis XV had it redecorated and added a game room. After the death of one of his beloved mistress, the sensitive, melancholy Louis XV cloistered himself away from his capricious court within the rooms of the Grand Trianon. Perhaps the ancient marble slabs and columns used to make the grand structure contained unseen, mystical healing powers; powers that soothed a grieving soul, because Louis XV retreated to the Grand Trianon after death crept into his quarter and snatched another of his beloved from his realm. When Princess Henriette of France, Louis XV's most-cherished daughter, died of smallpox, the king was inconsolable. He stopped eating. He stopped working. He wandered through he rooms of the Grand Trianon, a broken, dejected spirit. Looking at the above photo, it is easy to imagine, the usually dashing, handsome king, with his shoulders slumped, head down, hands clasped behind his back, as he aimlessly paces the length of the checkerboard floor of the Gallery. Although Marie Antoinette preferred the quaintness of the Petite Trianon, she did host several plays and performances at the Grand Trianon. Can you see her overly-powdered and preening coterie in their silken gowns and towering wigs gliding through the gallery? Can you see the comely comtesse laughing behind her fluttering fan as a dashing chevalier in an embroidered waistcoat hovers hopefully near her elbow? SGM: "The Parterres d’Eau of Versailles are adorned by beautifully detailed bronze statues all around its basins. 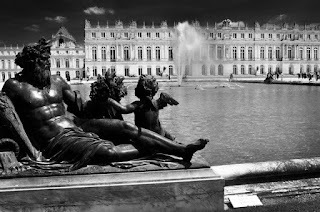 As I made my way around the basins, I came across this one statue and loved the way it presented itself against the magnificent Palace backdrop." Technical Details: Nikon F90, F/14 at 1/800 sec, 24mm focal length, no flash. This photo was turned into a black and white photo with Photoshop, and an orange contrast filter was applied. LMB: Aldous Huxley said, "The charm of history and its enigmatic lesson consist in the fact that, from age to age, nothing changes and yet everything is completely different." Was Huxley thinking about the gardens at the Chateau de Versailles when he coined that quote? For some things have changed (powerful storms have felled ancient trees, gardens have been moved, greenhouses dismantled), but so many things have remained the same. The Gardens of Versailles have been delighting visitors for hundreds of years. When Marie Antoinette was still young and adored by the French for her beauty and style, foreign visitors to Paris would buy a seat on a coche d'osier destined for Versailles. Latecomers or those short on coin would ride on the roof of the slow-moving carriage. Many visitors were underwhelmed by the palace and found the apartments to be dirty (pets, servants, and even aristocrats frequently urinated or defecated in the hallways), but few complained about the magnificent gardens. The Grand Canal (where Louis XIV often staged mock naval battles) and the Orangerie (with fruit trees from Spain, Italy and Portugal) delighted many, as did the full-operational fountains. The sculpture and fountain featured in Stephanie Gaveau Mounts' photo above were planned by Charles Le Brun and cast in bronze. The water from the pool behind the statue reflects light into the Hall of Mirrors (beyond). Today, this statue is a backdrop for Fêtes de Nuit, a spectacular and unique annual musical held on designated summer nights. A few years ago, on a balmy evening late in August, I sat with a small crowd (mostly French) who had gathered to witness the spectacle. As the sun slipped beneath the horizon, turning the palace and trees surrounding the garden into inky silhouettes, actors in period costume began reenacting a day in the life of the Sun King (from lever to coucher). The show included men on horseback (reenacting the hunt) and women in opulent gowns (reenacting a ball). There was enchanting music, a light show that illuminated the gardens and fountains and seemed to bring the statues to life, and even fireworks. I left that evening feeling spectacularly blessed to have witnessed what Huxley called "the charm of history." I was a 21st century woman sitting in a palace garden that had withstood incredible (indeed, revolutionary) changes - and yet - for those few brief hours, it was as if the gardens were as they had been three hundred years before, as the Sun King had planned them. It was if nothing had changed. Stephanie Gaveau Mounts is a gifted artist. Her unique point-of-view and superior skill allow her to capture images that are visually and emotionally stunning. Her images of Versailles will surely appeal to a wider audience than the esoteric followers of Marie Antoinette. If you would like to learn more about Stephanie Gaveau Mounts or purchase one of the photographs you have seen here, please visit her website, Belle Images by Stephanie. Amalia, Your comments are always so lovely and lift my day. Thank you for being a faithful follower of my blog. I am so happy you enjoy my writing! Beautiful photographs! They really captured the essence of such a magnificent old place--not just the grandeur, but the details that must have endeared themselves to those who lived in and loved the palace. Beautiful images and beautiful prose - I visited Versailles for the first time last November but spent the whole time having to chase my three year old around :-( Not good getting as far as the King's Bedchamber only to hear "Mummy I need a wee wee!" ....and realising there's no toilets for miles! Lovely to reflect on these images at leisure and make sense of what I saw. Thank you for sharing. CharityGirl - LOL! Thanks for sharing a great story. You can tell your son that had been visiting Versailles in Marie Antoinette's day, he could have "wee'd" right in the hallway - that's what the dogs and courtiers did! Thanks for visiting my blog, too!